Local chapters of the Association of Pedestrian and Bicycle Professionals are a growing area of our organization. Chapters form to connect APBP members professionally and to help them build support for the work of APBP members in their local area. Local chapters provide members with an opportunity to collaborate face to face in their area and raise the visibility of our organization. Activities can include meet-ups, networking, educational programs, guest speakers, webinar site hosting/discussions, field visits, mentorship, student engagement/instruction and local conferences. Dozens of chapters have been established since the program began in early 2014. A chapter can be formed by two APBP member co-chairs and a group of local/regional APBP members. If you are interested in starting a chapter, please contact Melanie Bowzer (mbowzer@amrms.com) at APBP headquarters. Memorandum of Understanding to form a new chapter. 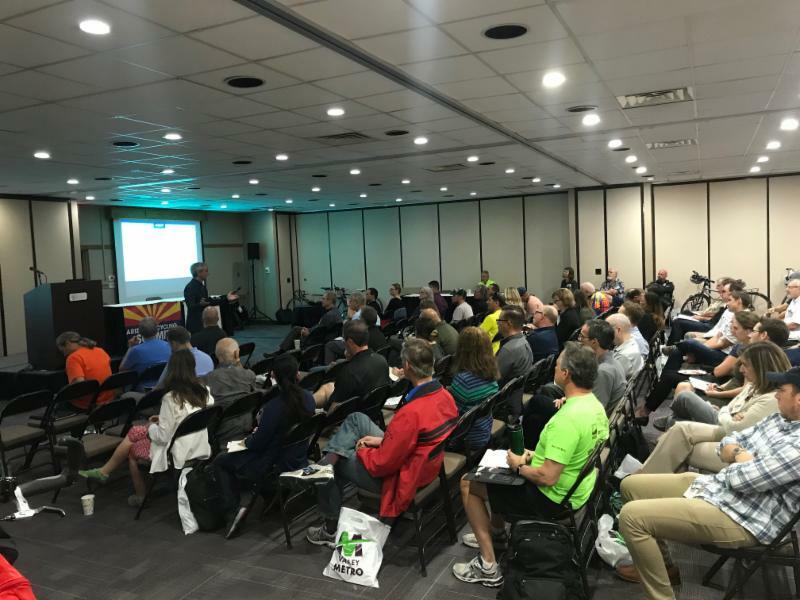 On Friday, April 5, 2019 the Arizona Chapter co-hosted the 2019 Arizona Bicycling Summit. Over 80 leaders, educators, planners, public health professionals, event promoters, and cyclists of all kinds gathered to discuss current issues related to bicycling in Arizona. Topics included panel discussions on shared active transportation plans and shared active transportation devices as well as presentations on the Loop, a shared-use path around metro Tucson, bicycle education, bicycle touring, and bicycle improvement funding. Be sure to share your chapter news and photos with Executive Director Melanie Bowzer.